If you are looking for a party bus in STL, hiring a vehicle from our extensive and luxurious fleet is the way to go. Your reservation comes with guaranteed, top-quality service and an amazing party bus that will create unbelievable memories you’ll remember forever. Our STL party buses can be reserved for any occasion, with some of the most popular being bachelor/bachelorette parties, concerts, weddings or just random nights out. The STL Road Pony fleet does it’s best to always be punctual, so your only concern is to have a great time! As an additional assurance for a worry-free evening, we put our luxury coaches through several rigorous tasks before we offer them up to our clients. This ensures that you will never run into sudden errors, always experiencing a smooth process from beginning to end. Providing a great selection of party buses to the STL area, with varying capacities and styles, STL Road Pony allows the opportunity for you to choose the vehicle that best satisfies your needs. We want you to have options, which is why we let you design your own special fleet by mixing and matching different buses that fit in with your event and the size of your party. We can help you with your customized fleet, creating the perfect transportation for you and your guests. Make your next night out with family and friends one that none of you will ever forget. Check out the members of our fleet to see what each one has to offer! They’re all standing by, ready to provide a fantastic addition to your next event, big or small! 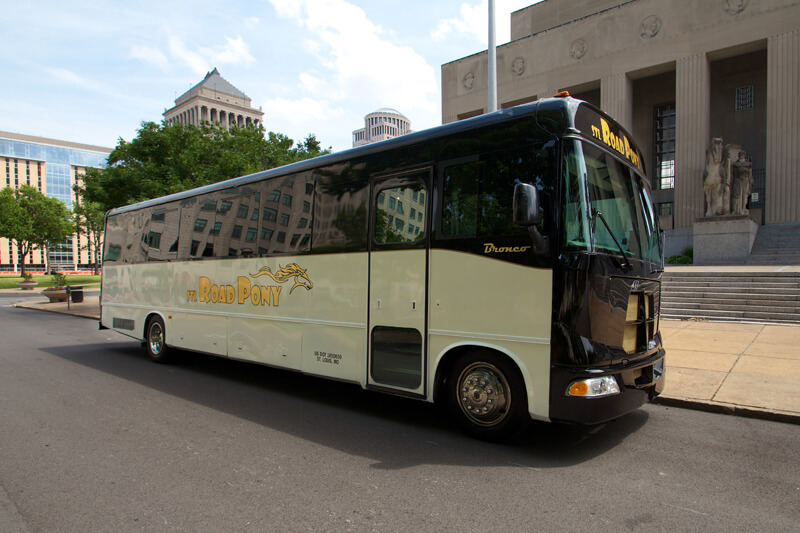 Call STL Road Pony now and make a reservation for a top-notch STL party bus experience! We are always looking to expand and want our customers to be happy. If you need a vehicle and we don’t have it, please let us know.